Last time, I wrote about how I went about designing my big autumn project: a colorwork jacket. Now, on to the knitting of this behemoth! 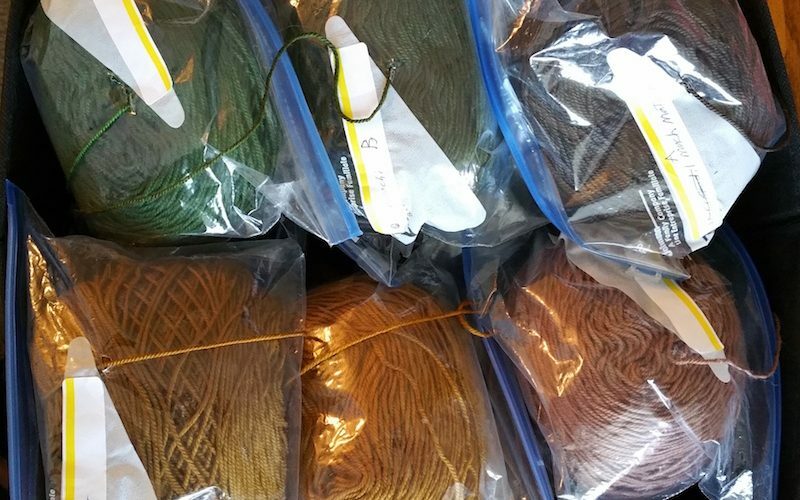 I had 16 skeins of Wollmeise Blend, each with a total of 546 yards, ready to be wound into center-pull balls. That’s 8,736 yards of yarn to be wound. A few years ago I bought an electric ballwinder from Nancy’s Knit Knacks, and I cannot recommend it highly enough. If you do a lot of colorwork (and I do), it is a lifesaver. I spent one happy afternoon winding all 16 skeins of yarn into a center-pull balls. 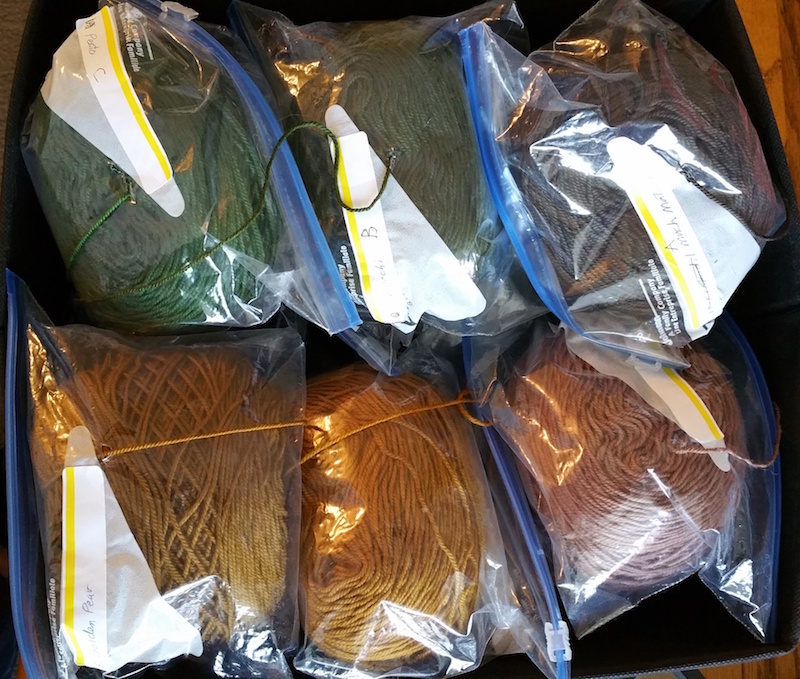 I slipped each ball of yarn into a plastic quart bag that I labeled with the colorway name and identifier I had assigned to that colorway (A – H for the foreground colors and 1 – 8 for the background colors. I poked a hole in each bag and fed the end of the yarn through the hole. Not a particularly high-tech or elegant solution, but one that works. Time to cast on! 522 stitches. (Gulp.) I almost always use a long-tail cast-on, and with this number of stitches, I knew would have a hard time accurately guessing how much of a long tail I need to pull out. So I cast on using both ends of a skein of yarn, and then cut the tail when done. Rather than cast on blindly and then try to count over 500 stitches, I cast on 50 stitches, count them, and place a marker. Repeat until all stitches are cast on. This design is knit in the round with a steek and cut open to create a jacket. 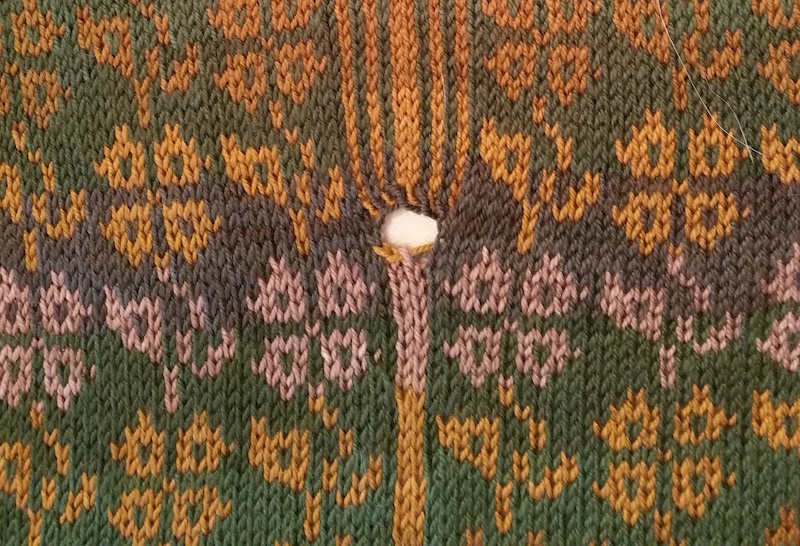 Typically when knitting in the round, one joins the cast-on stitches into a circle being careful not to twist and starts knitting in the round. But because I planned to knit a plain facing at the bottom of the jacket, I worked back and forth in stockinette stitch for the depth of my facing, using just one color and a needle one size smaller than the one I would use for the colorwork. This is because my tension in colorwork is tighter than my tension in plain stockinette. When my facing was the right depth, I worked one round purling on the right side to make it easy to fold the facing to the inside. Finally, time to join into a circle and start knitting in the round! 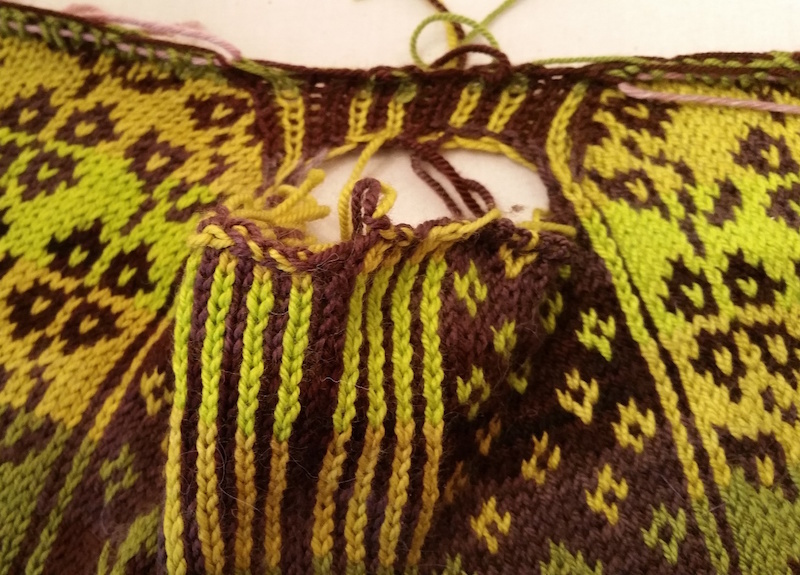 I switched to my larger needle and cast on 5 stitches (half of my steek stitches) at the beginning of the round. 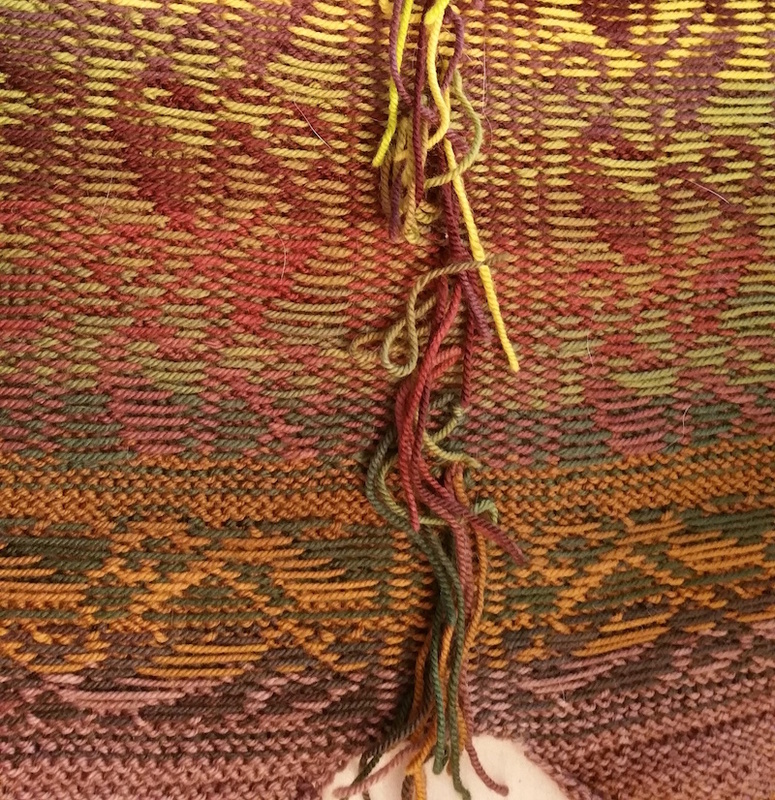 I worked the first round of my pattern, placing a stitch marker after each pattern repeat, and at the end I placed a marker and cast on 5 more stitches (the second half of my steek). The beginning of the round started in the center of my steek. 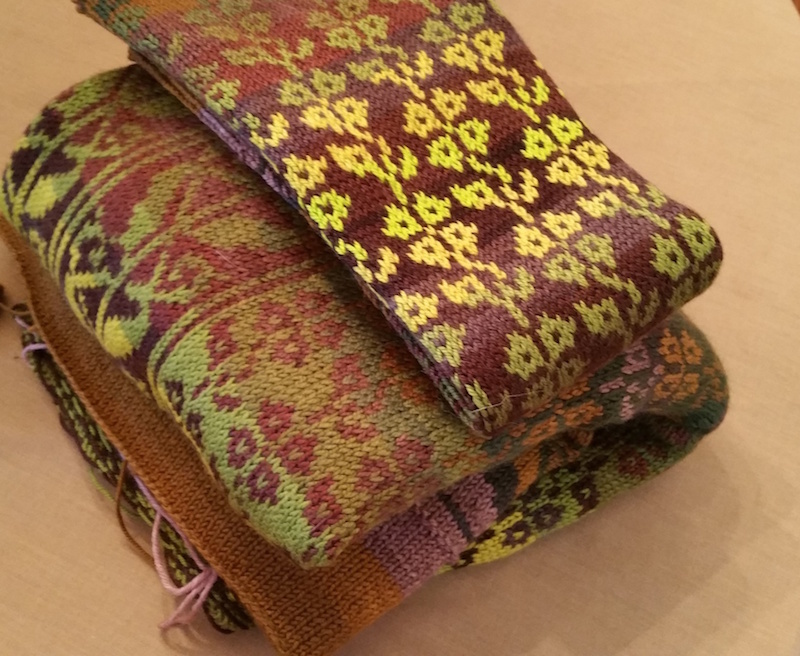 A huge advantage to doing this is that you don’t have to weave in ends, because the steek will eventually be trimmed. 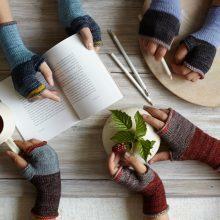 Four juicy skeins of Hazel Knits yield up multiple pairs of colorful mitts, and no worries about running out of yarn on the cast-on or twisting the stitches when joining to knit in the round. When working stranded colorwork, you need to pay careful attention to your tension so as not to end up with a crumpled-up mass (too tight) or a saggy loopy mass (too loose). I consciously spread my stitches out on the needle as I knit to keep the yarn not in use stranded across the back at an even tension. With this design there was no need for me to secure the yarn not in use by twisting it with the working yarn on the wrong side because the longest stretch of each color was only 7 stitches, and it is at 7 or 8 stitches that I usually secure the yarn. How you hold your yarn is important when working stranded colorwork. There are three general methods: hold both colors in your left hand, one color in each hand, or both in the right hand. (I defy this rule by not holding my yarns, but picking up and dropping each color as I use it with my left hand. I do not advise you to emulate my style: it works for me but it is inelegant and can slow you down.) 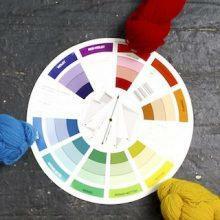 However you hold your yarn, you always want to work your colors the same way throughout your project. I grab the background color above the foreground color. That makes the foreground color pop. If you switch back and forth on which yarn is accessed on top, it will be noticeable in your finished project: subtle, but noticeable. For the body of the jacket I worked what essentially was a big tube. I had decided I wanted my jacket to be 36” long from neck to hem with 12” armholes, so when I had worked 24” above the bottom facing, I cast off one stitch at each side and cast on 10 steek stitches above the cast-off stitch on the next round. These would later be cut open to create the armholes. Two inches before I reached my desired length, I shaped the front neck. 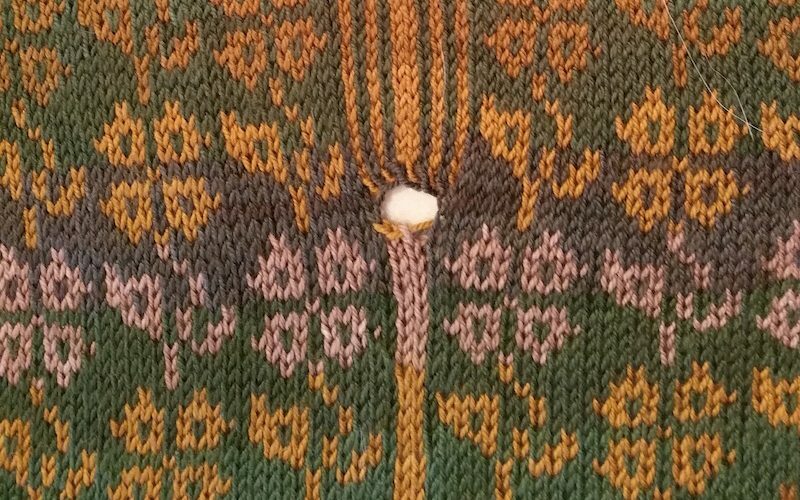 I cast off the 10 center front steek stitches, put “x” number of stitches on either side of the cast-off steek on holders, and cast on a new steek to bridge the now-wide gap. I worked neck decreases on each side of this new steek as I finished up the body. 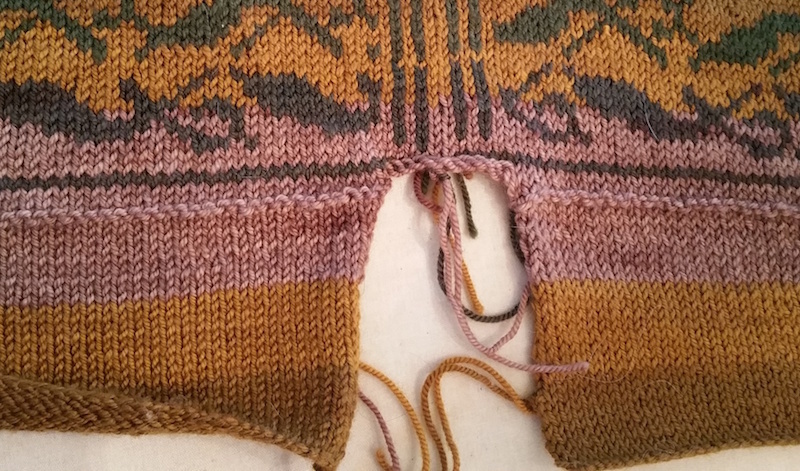 When I completed all the neck shaping and the body was the length I wanted, I put all “working” stitches on holders and cast off all the steek stitches: the new center front “neck” steek, and the two armhole steeks. I then knit two smaller tubes: the sleeves. Because the body of the jacket is drop-shouldered, I knit for only 16”, increasing stitches from cuff upwards. Upon completion, I put all stitches on holders. Next time, the final step: finishing! 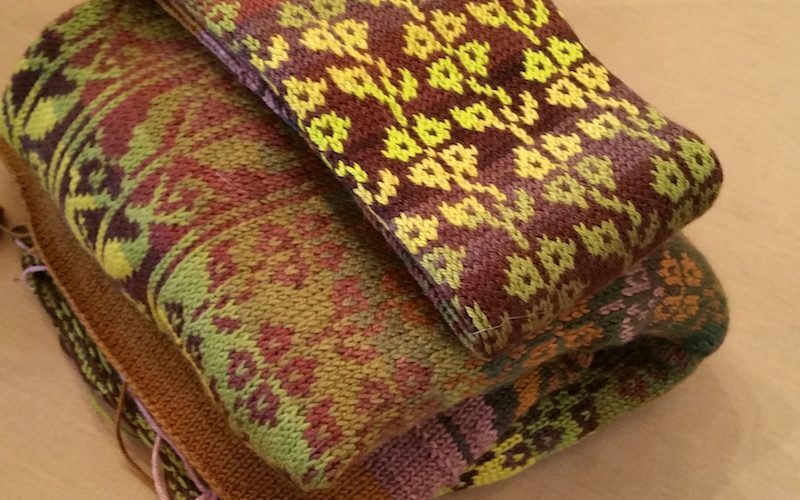 Editors’ note: If you missed Part 1 of Wendy’s colorwork project, catch up here. Wow wow wow! Everything so well explained. 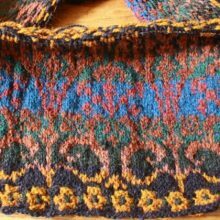 Searching for Fair Isle knitting is what first brought me to WendyKnits years ago. (That and toe-up socks.) I was so amazed and impressed. I really haven’t done much stranded colorwork, but I may just have to get back to it. Ditto for me. 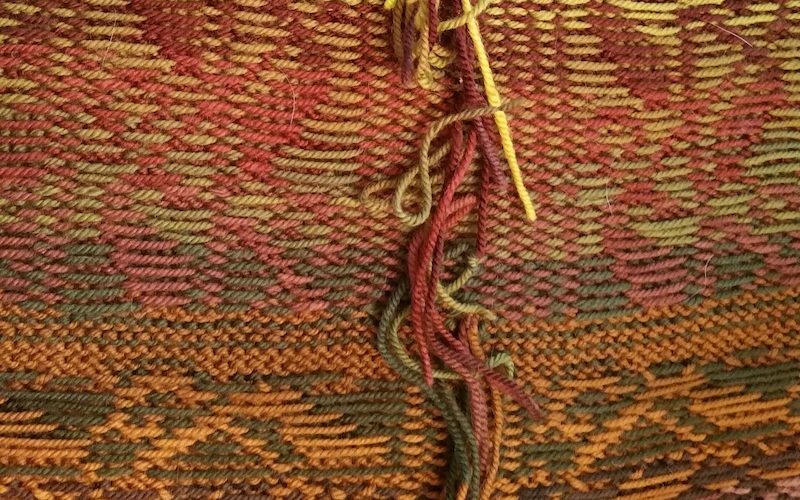 I love articles like this with subtle details such as noticing the difference when one yarn is carried above or below. I’ve followed Wendy’s blog for ages, so it really threw me to read her post here! There’s lots of great info here & I’m glad to soak in her wisdom, wherever she’s writing. Wendy gets around! We are thrilled to have her in our pages. Fabulous part 2….. but where can I find part 1? How could I have missed it? There’s a link embedded near the top of the article. can’t wait to see the finishing. I am a believer. I love the design of this but I treasure the ‘why’ part even more. 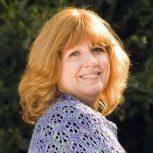 Wendy does such a lovely job with explanations that I can use her wisdom across projects. 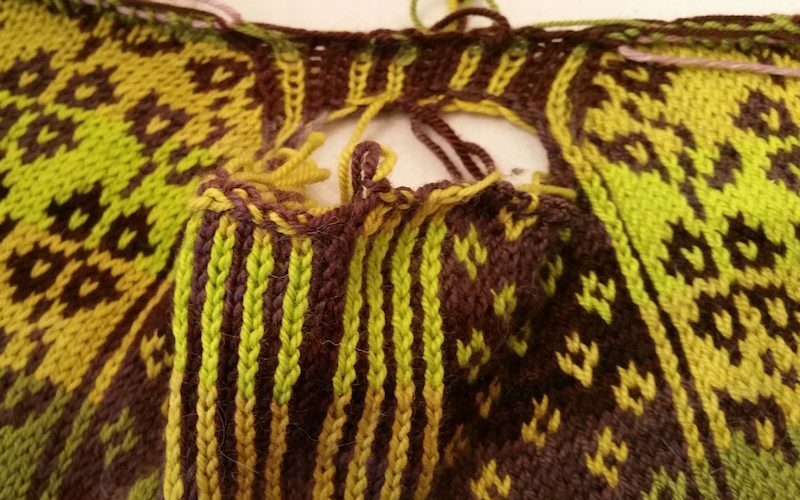 I read how you charted your pattern and it did not make much sense at the time – but seeing it knit up – oh, my! This is just beautiful and I can’t wait to see it finished and on. Thank you for your clarity in how you work and why. This is really useful for those of us starting out in Fair Isle, but so enamored by it. I hope to knit a jacket just like you one day!!! Thank you for all the comment love! 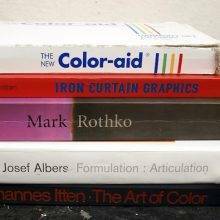 I am so pleased that you have found this project interesting, helpful, and/or inspirational!